The CoffeeShop Blog: CoffeeShop Paint With Light Photoshop/PSE Action! CoffeeShop Paint With Light Photoshop/PSE Action! First, some business. I wanted to thank those of you who order my action and digital design packs. Thank you so much for helping me keep everything on this blog free while being able to stay home and homeschool my kids. I can't even express properly how much your generosity means to me and my family. ♥ I am so blessed that I get to spend time working on something I am so passionate about and have also the opportunity to "pass it on" by providing freebies here at CoffeeShop. "thank-you" perks of ordering the download packs is that I constantly update them with my newest creations and if you email me I will send you the newest version (even if you purchased it a year or two ago!). That way you will always have access to my newest actions/presets/scrapbooking favorites. Now on to the "meat" of this post. I am so excited to post my newest action, "Paint with Light". This action is a perfect way to finish off your image by allowing you to selectively enhance light and increase contrast. Unlike many actions, you have to paint the contrast/light effects in by hand to customize it for each image. This allows you to be so much more artistic and can give you stunning results. 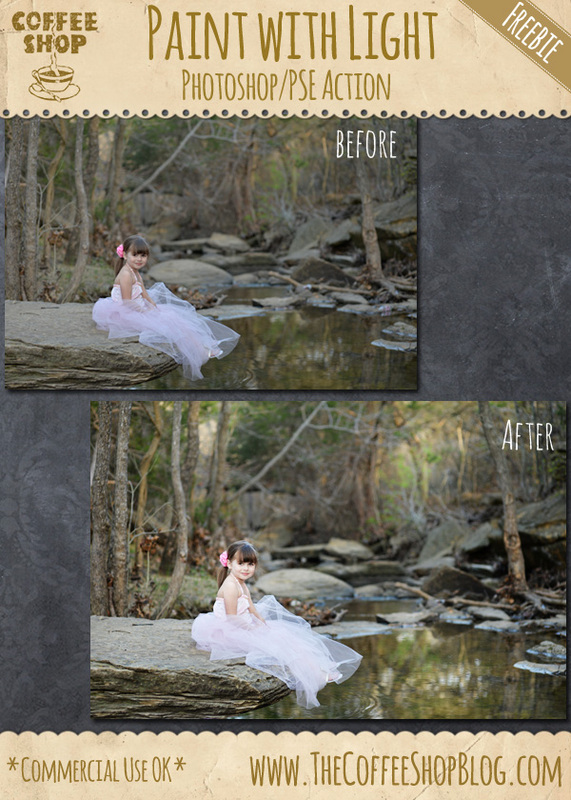 I used this beautiful image from Julie Peveto Photography (Facebook) for this tutorial. This is the original SOOC image. The contrast isn't bad and the colors are nice, but I really want to add some highlights and shadows/contrast to make it really stunning. 1. Add Light: Run the action. The first prompt is a Curves adjustment so you can adjust the contrast of the entire image. After the action runs you will see 5 layers. I start with the "Add Light" layer. Select the layer mask and use a soft white brush at various opacities on the image to bring out the light. 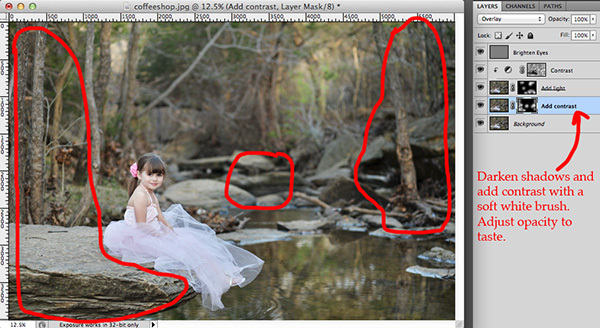 I circled some of the areas I clicked on with the brush. 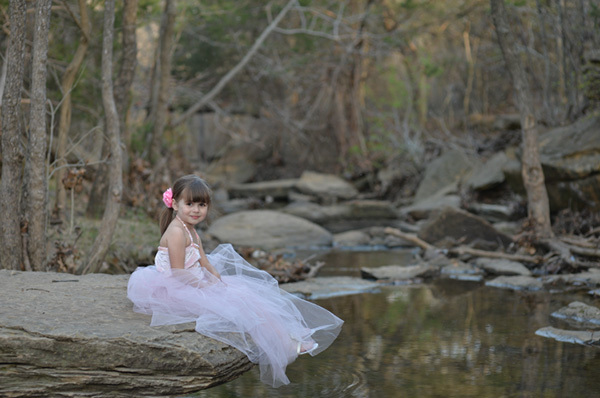 I added some light to her face, the areas in the woods that looked like they already had some light streaming through, and the water in front of her. 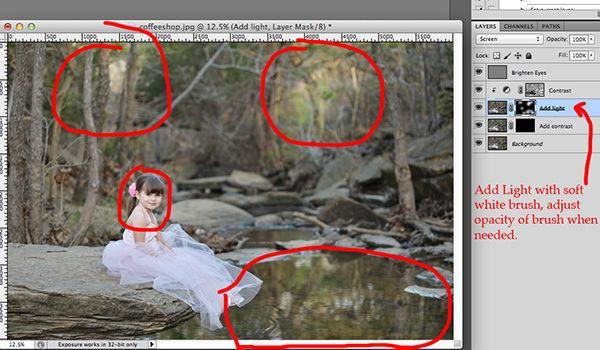 Here is what the layer mask looked like as I was working. 2. Add Contrast: When you use a soft low opacity white brush and paint on the Add Contrast layer mask you will see areas of the image get a bit darker and also more defined. I used this layer to darken the shadows and add some contrast to the trees and rocks. I also brushed some on her hair. 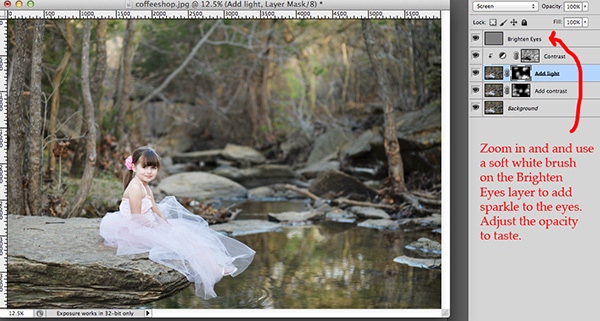 You can change the blending mode to overlay or soft light. 3. Brighten Eyes: I often like to brighten eyes just a bit, so I added this layer to finish up a portrait. Click on the top layer to select it, then zoom into the eyes. Use a soft white low opacity brush and pain over the iris until you are happy with the eyes. 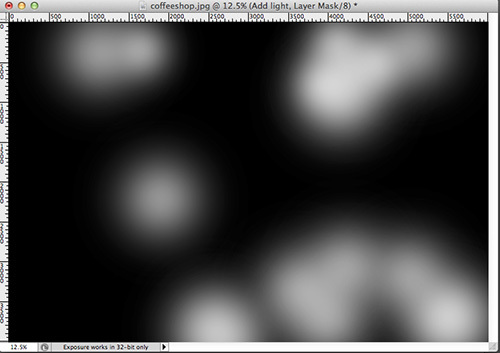 You can lower the opacity of this layer if needed. Don't overdo it! Here is the finished image. 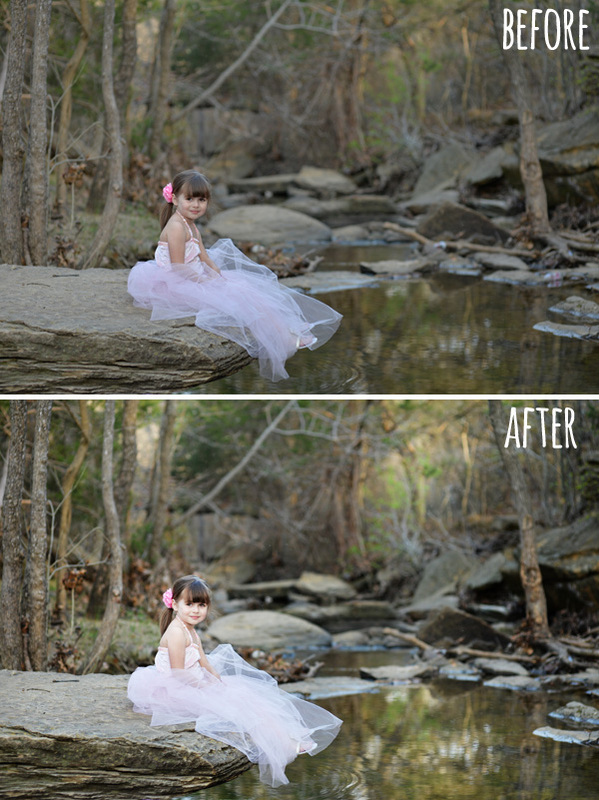 I love how this action enhances light in an image and leaves you with a clean, beautiful edit. This type of dodge and burn technique is so powerful and it only takes a few minutes to achieve with this action. Download the CoffeeShop Paint with Light Photoshop/PSE Action. You can also download it here. I've been looking forward to this one since you posted the Lightroom version. I'm so excited to try it out! I'm having so much fun with this action! I've been holding off getting Lightroom until I really learn PSE, so this action gives me lots of great opportunities to enhance some of my photos! THANKS!!! Love it! Thank you for using my image :) It looks great. I love your blog! I have learned so much about photography and photoshop through it. This action looks so versatile, I tried to run it on a flattened image (in elements) and I kept getting errors like "command make is not available" or "command select is not available" while the action runs. Any idea what I am doing wrong? Did i mention your amazing?? I am also having the problem of it saying the command "set" is not currently available. How do I correct this problem? "Add light" doesn't come with a layer mask. Why is that? I see in the picture that yours has a layer mask.